The Papyrus of Ani, famously called the “Egyptian Book of the Dead”, is a funerary hieroglyphic scroll totaling approximately 78 feet in length. Estimates of its origin come from the New Kingdom of Egypt circa 1250 BC. It is currently held at the British Museum. The Book of the Dead is a book of the afterlife. Rather than forming the ground for a theological body of work, it is merely a text to help the deceased pass into the next life. The text relies as much on images, or semiotics, as it does on hieroglyphic text. The edition used here was translated by Dr. Raymond O. Faulkner et al., and the numbering was designated by Richard Lepsius in 1842. 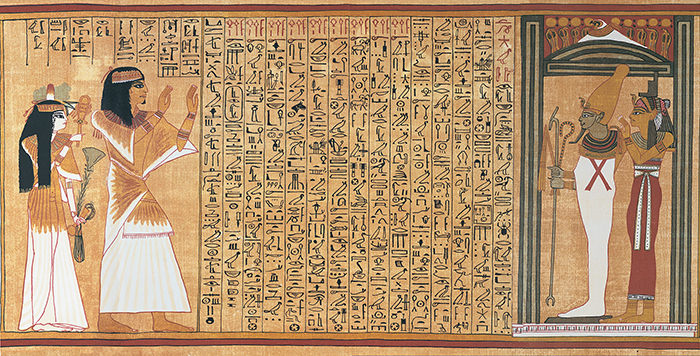 The collected texts are called The Papyrus of Ani: Royal Scribe of the Divine Offerings of All the Gods. The text opens with an Introductory Hymn to the Sun-God Re. It is scribed in the third person, mentioning two times “he said,” presumably referring to Ani, who is deceased. It addresses Khepri, creator of the gods, who rises and shines on the back of his mother, the sky, before sinking behind Manu, the mountain. The speaker implores that all beings worship Re, including fellow gods, so that he may vanquish his rebel serpent-foe. The speaker then requests that he see the sun-disk and behold the moon, that his soul be free to go where it pleases, that his name be called out, be given offerings like the followers of Horus, that a place be made ‘in the solar bark on the day when the god ferries across,’ and most importantly that he be received into the presence of Osiris in the Land of Vindication. It is dedicated to the ka of Ani. In order to distinguish the ka from more contemporary and sophisticated theological presumptions, we must remind ourselves that the ka is part of the five sides of the soul in ancient Egypt, ka the vital life-giving essence. Plate 2 presents an Introductory Hymn to Osiris, god of the underworld or Duat. Ani and Tutu requests for bread and offerings from Heliopolis, with his toes firmly planted in the Field of Reeds. Plate 3 is the critical moment where Ani’s heart, which he calls his ka, is weighed by the Keeper of the Balance. He asks that his heart be truthful in the presence of the god. Thoth, the judge of truth claims “I have judged the heart of the deceased, and his soul stands as a witness for him. His deeds are righteous in the great balance, and no sin has been found in him. He did not diminish the offerings in the temples, he did not destroy what had been made, he did not go about with deceitful speech while he was on earth.” They are located in Hermopolis and the Great Ennead (nine of the Enneads surround the text) agrees with Thoth so that Ammit (“she who swallows the dead”) will have no claim to him, and that he will be given land in the land of offerings, like the Followers of Horus. Horus then takes Ani to Osiris, and Ani addresses Osiris as Lord of the West. Osiris is also referred to as the Lord of Eternity. What does it mean for Ani’s heart to be weighed by Thoth against the feather of truth? What does it reveal about the political relationship that exists between the gods and human beings in the Egyptian world? In this vitally important scene, Ani pleads not with the gods, but rather he seeks out ways to pacify his heart of any wrongdoing, the scene is fundamentally a trial. If Ani is found to be blameless, his life after death begins. Ani is approved to proceed and is brought by Horus to his father, Osiris Winnefer. Following this moment, there are a series of incantations while the god answers questions to the listener who repeatedly asks “What is it” and “What does it mean?” Even in death, the Egyptian inquiry continues. Next there are a series of recitations that must be said once one approaches seven gates and purification spells are given to present the dead, that he or she may go forth into day without evil. Ani’s mouth must be given to him, he must be given magic, and his heart must be presented to him so that he may enter into the realm of the gods. The reader is given spells for transforming into a swallow, a falcon of gold, a divine falcon, a snake, a crocodile, Ptah, soul of Atum, Benu-bird, a heron, a lotus, and finally into “a god and giving light and darkness.” Osiris is identified as foremost of the Westerners. Ani rows on the waterways to the Field of Reeds. A praise of Osiris is given as a kind of sweet honey to compel the god to allow safe passage for Ani. We are not given the results of Ani’s quest, only the potential for a human being’s capacity to influence and persuade the gods to continue living in the next life. Ultimately, the Book of the Dead is a wishful action from the human being to the god. The Egyptians, unlike the Israelites, have a point of equality with the gods -every trial is predicated on a common ground of agreement. 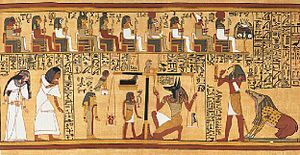 The Egyptians do not live in fear and trembling before the gods, instead they are able to compel the gods, through the words of the hymns listed in the Book of the Dead. Unlike the Israelites, both the Egyptians and the and the Greeks are water faring groups. Their lives are safer, similar to the gods -protected from evil but not necessarily from suffering. While the God of the Israelites tests the Israelites, the gods of the Egyptians give trials. Humans beings can implore the Egyptian gods. YHWH demands obedience, while the Egyptian gods demand justification. Therefore, the Egyptian relationship with the gods is closer to one of friendship, perhaps even kinship.